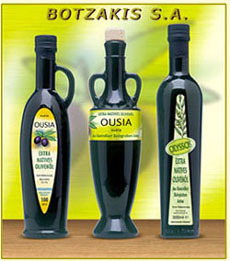 Botzakis S.A. comprises one of the top olive oil producers in Crete. Botzakis S.A., a family run company, following the long lasting tradition of olive oil production in Crete, produces premium quality olive oil. In its state-of-the-art, vertically organized production plant in Heraklion, Crete, Botzakis S.A. creates its own 'little' miracles in olive oil.